Auschwitz, the first place Jason took me to photograph. When Jason told me in Prague that we were headed to Auschwitz, my jaw dropped. I almost thought I miss heard him. I asked hesitantly - “the concentration camp?”; he responded, “exactly”. We arrived late afternoon and obtained our tickets. As we entered the campus our demeanors had changed- and rightfully so. 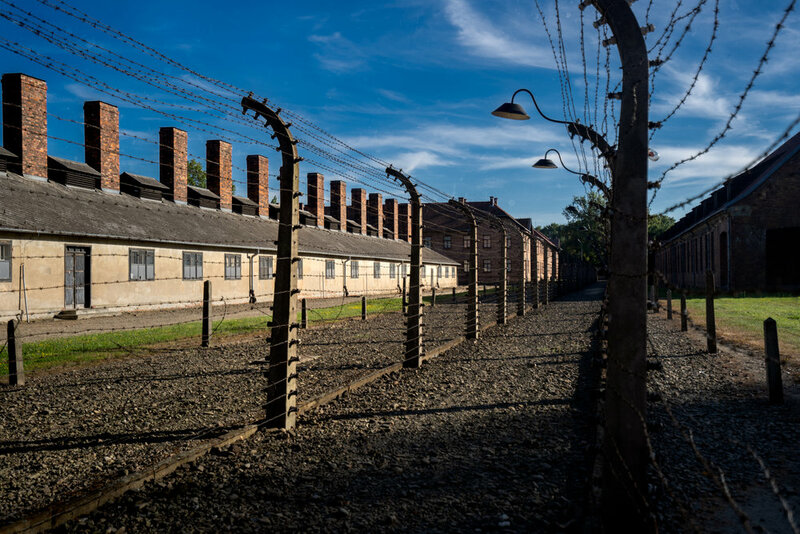 Auschwitz was the largest concentration camp governed by Nazi regime. Over the course of five years (1940-1945) approximately 1.1 million individuals were murdered on the premises by SS authorities. Jason and I entered the property and walked on a dusty stone path. We were drawn toward a metal arch that read: “ARBEIT MACH FREIT”. I asked Jason what that meant and shared it interpreted to, “work will set you free”. Chills covered my spine and my lips curled with disgust. I remember squinting my eyes and almost turning my head away from the brutal lie. We had now stepped foot on a location where a significant modern-day atrocity took place. In complete silence, we walked around the perimeter and took in our surroundings. It wasn’t long until we found ourselves off the beaten path. We strayed away from tourists and ended up photographing inside the double barbed wired, electric fences. Large sized stones shifted underneath my feet. I walked the path attempting to imagine or recreate in my mind the events that occurred. I recalled feeling complete remorse as I imagined thousands of people trapped inside these walls, stripped of their clothing in the middle of winter. Awful - black and white still images would flash in my head as I attempted to recreate the scene in my mind. I attempted to empathize, but I just don’t believe my level of empathy would even come remotely close to what the individuals at Auschwitz actually experienced. Whatever I felt, I was certain of one thing, the need to be present. A whirlwind of emotions flooded my system. Inside the gated fence, I really started to feel enclosed. Jason and I had no way of exiting, other than from the place that we entered. We just kept walking and walking and I quickly was faced with this challenging paradox. Inside the fences, I felt a sense of entrapment. On the other hand, I felt completely liberated. 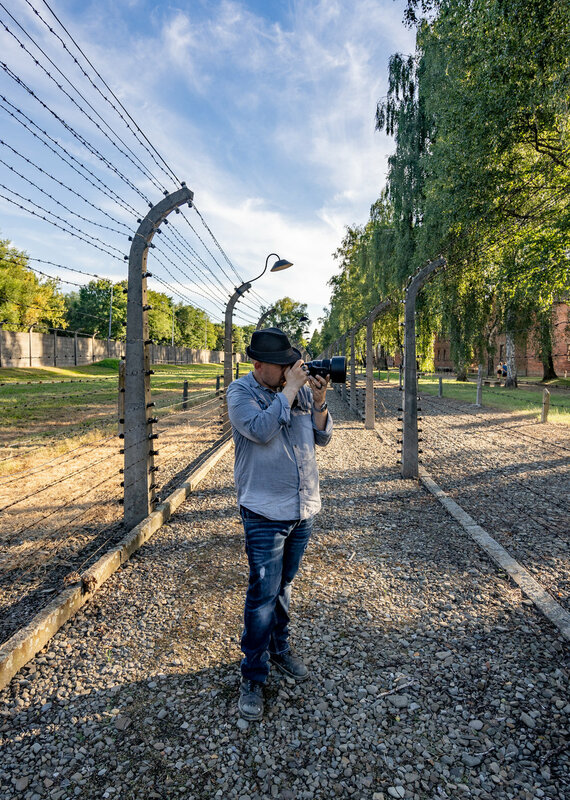 Here I stood in the center of Auschwitz, documenting history for the first time with my boss, Jason Lanier. That movement moved me. It was an incredible experience that I have difficulty articulating; however, it is one that will resonate with me for as long as I live. Closing time approached and Jason and I headed back to our hotels and reconvened for our second visit the following morning. We arrived at the concentration camp mid-morning and were surprised to see how busy it was. With intent of covering more ground, we walked in and out of the barracks and toured the hallways inside. The space was tight and the rooms were packed. We observed articles of clothing and personal remnants stored behind glass windows. With attentive eyes and open ears, we navigated our way through the camp, taking in as much information as we could process. Each barrack contained signs that described what the horrors associated with each location. From hangings, to shootings - it was nearly impossible to stand foot in an area free of sin. Most locations were accompanied with an exact image that had a way of bringing you back in time. Hours had passed and we were coming close to an end. The last location we got to see was the gas chamber and crematoriums. It was in those buildings that the SS told the jews they were going to take a shower and initiated experiments with toxic gas; thousands of people were killed there per day. We entered the gas chamber and a tour guide and tour group followed behind. The tour guide was silent and pointed to two places in the ceiling, one over his head and one over ours. Jason and I looked up and realized that we were standing directly underneath one vent where toxic gas poured through. It was dark and damp inside. Walls were covered in scratch marks. I felt absolutely saturated with disbelief and remorse. Guided groups would enter an exit. We captured images after they left. I thoroughly enjoyed when the rooms were empty. The brief moments of silence experienced in between groups provided opportunity for me to breathe, think, and remember the event that took over a million lives. Jason and I spent about 30 minutes inside the crematorium documenting the artifacts that were illuminated with ambient light. That light in the crematorium really held symbolic meaning for both Jason and I. In awe, we watched and thought about the light shining through the door, as it was the last bit of light these individuals ever saw.